Russell Westbrook messed around and got a 12 point, 11 rebound, 10 assist triple-double and a win against the Jazz 122-113. Ricky Rubio scores 21 points and Donovan Mitchell adds 16 as the Utah Jazz sweep the season series with the Wizards by defeating Washington, 107-104. 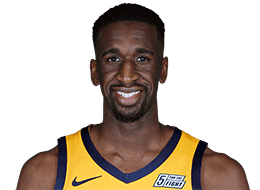 Ekpe Udoh grabs the offensive rebound and spins around for the put back layup while being fouled for a three-point play. Donovan Mitchell draws the double team then finds Ekpe Udoh wide-open in the lane for a floater. Alec Burks gets it from Ekpe Udoh and cuts inside for the slam dunk. Appeared in 42 games (14 starts) for the Milwaukee Bucks, averaged 3.4 points, 3.5 rebounds, 0.7 assists, 0.4 steals and 1.0 blocks in 19.1 minutes... Missed eight games from 1/25-2/8 with a sprained left ankle … tied career high of six blocks on 12/4 vs. DET … played season- and career-high-tying 39 minutes vs. BOS on 11/30 and recorded nine points and 10 rebounds … had second career double-double vs. OKC on 11/16 with 11 points and 11 rebounds … earned his first start of the season on 11/13 at ORL and started in 14 games this season … returned to the lineup on 11/6 vs. CLE after missing entire preseason and first three regular season games after knee surgery and finished with four points, five rebounds and one block ... had 26 DNP - CDs this season. 2012-13: ... Averaged 4.3 points, 3.3 rebounds and 1.1 block in 75 games … led the Bucks in blocked shots on 16 occasions … recorded multiple blocks in 24 games, including a season- and game-high five in the Bucks’ 27-point comeback win at Chicago on Nov. 26 … with 84 total blocks, was one of just three players in the league to amass 80+ blocks while averaging under 20.0 minutes per game … made his first of eight starts on the season vs. Boston on Dec. 1 … scored in double figures in back-to-back games from March 10-12 – the second pair of consecutive 10-point games in his career … recorded his first career double-double with 14 points and a career-high 11 rebounds on March 30 vs. Oklahoma City … suffered ankle sprains on Feb. 27 at Houston and April 5 at New York, which resulted in three missed games … also sat out the Dec. 12 game vs. Sacramento with a wrist injury … received two DNP-CDs. 2011-12: Appeared in 61 games split between Golden State and Milwaukee ... averaged 5.6 points, 4.2 rebounds and 1.67 blocks (11th in NBA) on the season ... posted 33 multi-block games, with a league-high 26 of them coming in a reserve role ... scored in double figures nine times and had two games with 10 rebounds ... started 11 games (five with Milwaukee) and averaged 10.5 points, 5.7 rebounds and 1.82 blocks as a starter ... scored a career-high 19 points (9-of-14 FG) on 2/20 vs. the L.A. Clippers ... acquired by Milwaukee along with Kwame Brown and Monta Ellis in exchange for Andrew Bogut and Stephen Jackson on 3/14 ... led the Bucks in blocks in 14 of his 23 games in Milwaukee ... grabbed a career-high 10 rebounds on 3/22 vs. Boston, and matched that effort with 10 boards against Atlanta on 3/27 in his first start in a Bucks uniform. 2010-11: Appeared in 58 games (18 starts), averaging 4.1 points, 3.1 rebounds and 1.48 blocks in 17.8 minutes per contest … among NBA rookie leaders, ranked 1st in blocks and 16th in rebounds … started 18 games, averaging 5.7 points, 4.3 rebounds and 2.28 blocks and 25.5 minutes in those contests … posted career-high 16 points on 8-of-12 shooting in 30 minutes at Phoenix (2/10) … registered two-or-more blocks in eight straight games (3/16 - 3/29) which is the second-longest by a Warriors rookie since Robert Parish recorded nine straight in January 1977 … made NBA debut vs. Miami (12/10) and collected two points in three minutes … missed first 22 games of the season after undergoing off-season surgery (July 14, 2010) to repair a torn ligament in left wrist … recorded 10-plus points six times … recorded three-plus blocks 12 times, including two games with five-plus … was on inactive list 22 times and registered two DNP-CD's on the season. Played three seasons (two at Michigan, one at Baylor), averaging 8.4 points, 6.3 rebounds and 1.5 assists in 103 career games … named Honorable Mention All-American as voted on by the Associated Press as a junior at Baylor … named Big 12 Newcomer of the Year and All-Big 12 Second Team by AP and conference coaches as a junior … named Big 12 Defensive Player of the Year by Sporting News as a junior … named to Big 12 All-Defense and Big 12 All-Rookie teams by conference coaches as a junior … named to Big 10 All-Defensive team as a sophomore while at Michigan. Full name is Ekpedeme Friday Udoh ... pronounced Ekpe (EH-pay) Udoh (YOU-doh) ... son of Alice and Sam Udoh ... has one older brother, Eddie, and two younger sisters, Esther and Sefon ... both of his parents are from Nigeria ... his parents, who are both of average height, were told that Ekpe would not be tall when he was young ... however, his grandfather on his father's side was seven-feet tall ... returned to Baylor following his rookie season to complete his education, earning 14 credits to secure his bachelor's degree ... was very active in Warriors community outreach programs during his rookie season ... visited children at Kaiser Permanente Hospital in Oakland, took part in the Lucky Thanksgiving food distribution and helped encourage fans to use public transportation by passing out prepaid BART cards on a BART ride from Oakland to San Francisco as part of the Esurance Green Mob ... also took part in several Read To Achieve events and participated in a special Season of Giving Holiday Party for 20 kids from the Make-A-Wish Foundation and their families at the practice facility, which for the day was morphed into a giant playground with numerous kids activities ... following the devastating tornadoes that swept across portions of Oklahoma, Kansas and Missouri in April and May of 2011, returned to native Oklahoma to assist in the ongoing recovery and cleanup efforts ... favorite TV shows growing up were Fresh Prince of Bel Air and Martin ... favorite TV show now is Criminal Minds ... enjoys listening to rap, R&B and gospel ... favorite musical artists are Jay-Z and Young Money ... attended high school with former NFL player Reggie Smith ... was named to Oklahoma McDonald's All-State team in 2006 following his senior season at Sante Fe High School in Edmond, OK ... won state championship as a junior in high school ... wears size 16 shoes.